Electricians install, connect, test and maintain electrical systems for a variety of purposes, including lighting, climate control, security, communications and electronic controls for machines. They work in homes, businesses, factories, sports stadiums, skyscrapers and power stations. When installing electrical systems, electricians work with blueprints, which indicate where circuit boards, power outlets and load centres need to be placed. installing and maintaining street lighting and traffic management systems. >>WHAT QUALIFICATIONS DO I NEED? >>WHERE CAN I GET MORE INFO? >>WHAT SUBJECTS DO I NEED? Why engineering? I enjoyed physics, maths and computer science at school. Instead of becoming a computer programmer, I chose engineering as it teaches you the art of problem-solving. You also learn about how physical devices work, which is huge fun. What training did you undergo? I attained a BSc (Hons) degree in Electronic Engineering at the University of Natal. I then took an online course in Lumped Circuit Abstraction from MIT (USA), wrote the exam and passed it! What makes a ‘good’ engineer? You need to be hard-working, dedicated and have an enquiring mind. It is an intense degree, with only 20% or less of first year students making it through. There are long hours of lectures/studying, but it’s worth it, as you end up in a rewarding career. Describe a typical day on the job I arrive at work and usually get caught up solving a software or hardware problem at an antenna. This can take the whole morning and I’ll either be modifying software or writing new automation software. This is my most productive and creative part of the day. After lunch, there’s more programming, and checking of emails. I leave paperwork for the afternoon. What do you appreciate most? The ability to create new things from scratch. Advice for someone starting out in engineering? Read lots of books like How to Win Friends & Influence People, or Skill with People by Les Giblin. You can be the most brilliant engineer, but if you don’t have a personality that relates well to people, you will not progress far. Also, keep a positive mindset, and respect everyone for who they are – from the cleaner to the CEO. What’s been the highlight of your career to date? Designing the control software for a NASA-funded project in Washington DC in 2002. It was a complex piece of code for a very sensitive optical instrument. I worked on it for six months and loved it. Why did you choose this profession? I enjoy working with people and prefer being on the road than in an office. There is always work available for electricians because it’s one of the most common trades, and there is always a lot of growth potential when you work for a well-known company. What training did you undergo and where did you do it? I did an apprenticeship section 28 with ECA and Train All training centre in Cape Town. Describe a typical day on the job We mainly work on maintenance on electrical work in houses and small buildings – like plug points, light fittings, earth leakages, etc. Every day there is something different and we are always needed. What are the best parts? I enjoy a good team spirit, and when a client is happy with my work. What don’t you like? I don’t like it when sometimes a client thinks they know what is wrong and overrun my decisions when I’m fixing a problem, in the end realising that I did intend to do the right thing. This is why you need lots of patience and good social skills! Have there been hurdles to overcome? I have found that in this industry you have to keep your focus and be positive because when I started it was not easy. I did not get a lot of help and not many companies wanted to hire me because I hardly had any experience. Career highlights? When I resolve the problem by giving satisfaction to the ones in need and I can look back and be proud of how much experience I have gained. Your future goals are… To find myself managing a big electrical company. How does experience weigh up against formal training? The more experience you get, the better equipped you are mentally and physically. What makes a ‘good’ electrician? An electrician needs dedication, passion and a hard-working ethos. Any advice for someone starting out in your career? Always be willing to learn and take on new opportunities. Never give up. Preconditions for becoming a certified electrical contractor include completing an electrical contractor apprenticeship and passing a Trade Test. 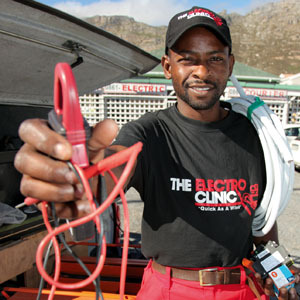 There are many TVET Colleges, as well as learnership and apprenticeship programmes, that offer qualifications as an electrician. Another option is to complete a Bachelor of Science: Electrical Engineering degree, plus an additional master’s degree, followed by a training programme within a specific company. A National Senior Certificate that meets the requirements for a diploma or degree course is a prerequisite for many courses. Registration with the Electrical Contracting Board of South Africa, which is a requirement prior to operating as a contractor, can only be completed once registration as an accredited person through the Department of Labour has been finalised and a certificate of registration issued.